While pirate attacks on the world’s seas have fallen for the third consecutive year, small tanker hijacks by armed gangs are escalating in Southeast Asia, reveals the International Chamber of Commerce (ICC) International Maritime Bureau (IMB) in its latest piracy report. IMB’s Piracy Reporting Centre says gangs of thieves armed with knives and guns are making Southeast Asian waters increasingly dangerous for small tankers carrying products such as gasoil or marine diesel oil. Boarding the ship at sea, pirates hold the crew hostage for a short time while they unload all or part of the cargo, which they then use, or sell locally. Of the six vessels hijacked worldwide in the third quarter of 2014, five were in Southeast Asia. The number of incidents reported in Nigeria has dropped noticeably, down to 13 in the first nine months of 2014, from 29 in the same period last year. Elsewhere in the Gulf of Guinea, Ghana recorded four incidents in 2014 compared with no incidents in 2013. 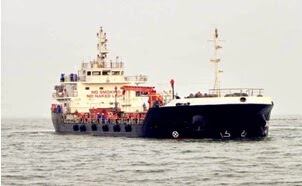 This includes the hijacking of two product tankers – and theft of their cargoes – and a fishing vessel and the taking hostage of 86 crew members. Why small tankers? Because of their small crews, lack of security, ease of boarding, ease of transfer of product to another vessel, and high value cargo. It also helps if there is little or no sea law enforcement force out there. Friday Fun Film: "A Salute to the Navy"
On that "Third Offset Strategy"
Disaster Prep Wednesday: Buy that Insurance! Wing in Ground: Is WiGgy Coming Back?